It's Monday again tomorrow and I'm already thinking what to wear for the entire week ahahaha. 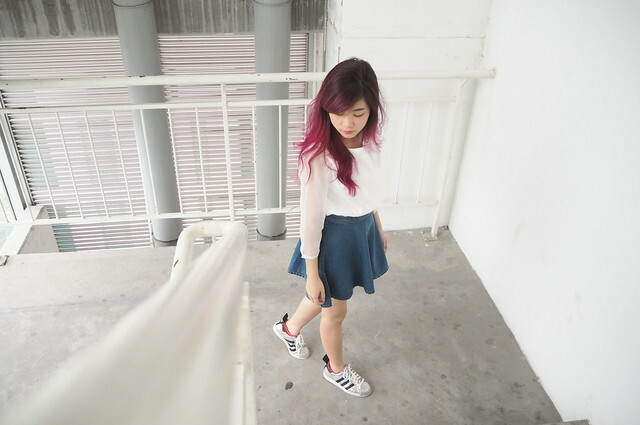 Taking a break from doing my assignments, I took some time to compile some of my favourite outfits from Stylenanda and I thought I would share them with you girls! On a side note, I would like to thank every single one of you who support, appreciate and actually look forward to this reading this segment (the weekly outfit inspirations series) on my blog!! But now, I'm thinking whether I should update my blog with this segment every week or every fortnight...LET ME KNOW!! I guess this is my favourite outfit of the week - I get a sense of serenity from wearing blue and white together. And not to mention, I think the skirt is really flattering, which makes my legs look slimmer than they actually are hahahahah. 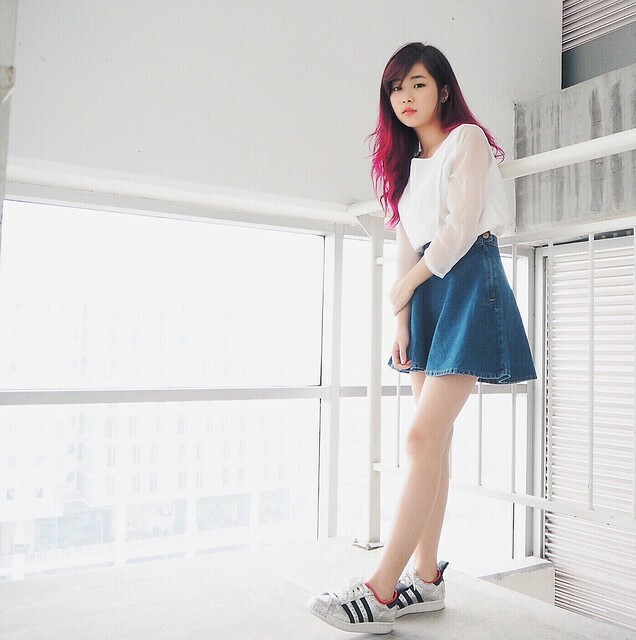 A more Korean-ish and vintage approach in styling a denim skirt. I also love how she layered a sleeveless knitted top over a collared shirt! 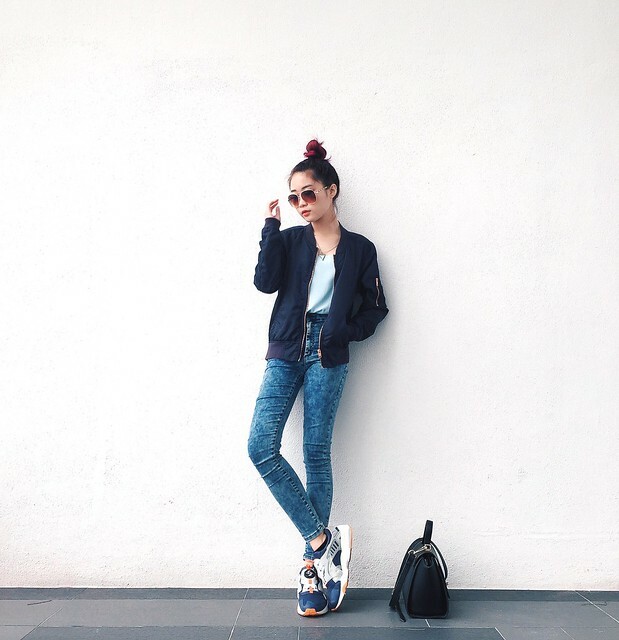 How many shades of blue you can see from this outfit hehehe? I can't describe how much I love this look! The pink sweater adds a vibrant hue to the entire outfit but the outfit still looks pretty cool and edgy! On Wednesday, I put on this hoodie from Bershka that has cute prints and patches all over it. The patches are the reason why I bought this hoodie though hahhaha! Looking for new ways to spice up a mundane outfit? Throw on a long checkered outerwear like her!! Tennis skirts are also one of my wardrobe staples other than button-down skirts! I often receive comments on Instagram complimenting my "long legs", but honestly, I don't consider my legs long at all. It's mainly because of the apparels I wear and my photographer, which make me look taller lolol. Wearing high-waisted bottoms really helps to create an illusion of having longer legs!! I think I will never get bored of wearing tennis skirts hehe!! Apparently, I still can't get over the button-down skirts. It's really my wardrobe staple at the moment because I can dress it up in so many different ways! This style totally screams "autumn" to me because of the cream and burgundy colour combination. Totally a great look for school and fall!